"Site Fights High" in the site fights! Please, click here to cast your vote for us!! Thank you so much Lady Lavendar! Two great awards after a tough week! for showing such tremendous Spirit! Your Spirit shines so brightly for all to see. is in honor of those who have truly found the Spirit of The Site Fights. and enjoy searching The Site Fights to share their Spirit! 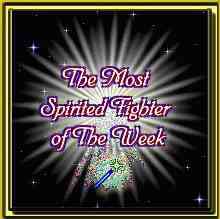 the Most Spirited Fighter Award for this week! throughout the entire Site Fights! Click here to cast your vote for us!! Thanks!